Make believe is no longer just for children. This summer, the 39th annual Sterling Renaissance Festival in Sterling, New York, plunges you into the 1500s, an age of knights, queens, dragons, sword fighting, and jousting. Unlike any other, the Sterling Renaissance Festival in the Finger Lakes is a living re-creation of an Elizabethan village at festival time. Not merely attendees or spectators, visitors are encouraged to partake in the fun of an earlier and perhaps more daring and jubilant time. As you enter the wooded grounds of the Sterling Renaissance Festival, you hear the clanging of swords and horse hooves off in the distance. Adding to the hustle and bustle on the streets are entertainers and merchants selling their wares, and it’s hard to tell who is an actor and who is a visitor. Although costumes are optional, many Renaissance Festival enthusiasts and all of the village’s citizens are clad in 16th century garb. Everywhere you turn, everything that’s done and said around you leaves you feeling as if you’re a part of Renaissance life. That’s because at the Sterling Renaissance Festival in the Finger Lakes, you can’t help but be immersed in the truly interactive experience created by this environmental theatre. Capturing your attention could be the entertaining antics of the local jester, or the main jousting tournament event where knights and horses dare each other on. Wench auctions are frequent, but if you’re not careful and get too close, you’ll find yourself up for sale! Your senses are stirred as a dizzying array of circus acts, acrobatics, and sword fighting finds you stopping in your tracks to be marveled and amazed, and the aroma of hot apple dumplings and mile-high cakes wafts through the air. To fill your belly, follow your nose until you happen upon any number of treats, like soft pretzels and cold crisp pickles, or stop for a turkey leg fit for a King or Queen! Hearty drynks like mead, cider, beer, wine, and wine slushies will round out your Renaissance fare. With a backdrop of minstrels and musical groups playing their lutes, guitars, and harps, your gaze may land on artisans blowing glass or crafting beautiful flower crowns. If you didn’t arrive in costume, you can outfit yourself at the Sterling Renaissance Festival marketplace, where you’ll find clothing and costumes, armour and weaponry, jewelry and leather goods, and arts and crafts. An entertaining and enriching experience for adults and children alike, the Renaissance Festival in the Finger Lakes is the perfect combination of theme park and interactive theatre. Where else can you hurl tomatoes at a restrained rogue, ride a camel, or perfect your axe throwing skills? Children can have a swashbuckling good time aboard a pirate ship, fly on a fiery dragon, or slide down the goose neck slide. The variety of rides and games keeps youngsters interested and excited, and the 12-stage performance venue gives guests of all ages a chance to rest, watch, and participate. Open rain or shine, I recommend you dress comfortably, since the natural terrain of the 35-acre Sterling Renaissance Festival can be hilly in areas. With the exception of the queen, who is transported in a horse drawn carriage, guests and citizens walk everywhere. Although the woods provide some shade, make sure you and your family are prepared for a warm day of fun. Adding to the fun and uniqueness of the Sterling Renaissance Festival experience are different weekend themes, which enhance the characters and events. Beginning with Family Appreciation Weekend, patrons can buy one adult ticket at regular price and get one ticket for half price, or get one child’s ticket free for every regular price ticket purchased. Other weekend themes include “Market Place,” “Ale Fest,” “Pirate Invasion,” “Highland Fling,” “Fantasy, Fairies, & the Future,” and the “Grand Finale.” New in 2015 is a Royal Renaissance Feast on Sunday, July 5th at Rose & Crown Tavern. Reservations in advance are necessary. 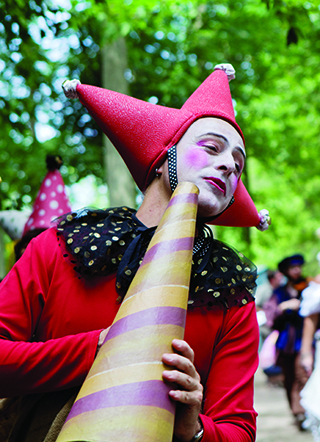 Located in Sterling, New York, in the Finger Lakes Region, the 2015 Renaissance Festival is open on weekends (Saturdays and Sundays) from July 4th to August 16th. Open from 10 am to 7 pm, adult tickets (ages 12 and up) are $25.93 and children’s tickets (ages 5 to 11) are $15.95. Children 4 and under are free. Tickets can be purchased online or at the festival upon arrival. Discounts are available for two-day or season passes, and parking is free. Although lodging near the Sterling Renaissance Festival is limited (campgrounds are nearby), additional accommodations can be found in Weedsport and Auburn. If you want to stay in the Finger Lakes longer than a weekend, be sure to visit nearby Sterling Lake Shore Park & Nature Center, Fair Haven State Park, and the Little Red School House Museum.